When Ken gave me the chook dinner set for my birthday, it was time for serious culling of dinner sets in our household. I am not like some of my friends who have multiple dinner sets just because they love them - even if I did like many dinner sets, we don't have the space to store them. (Mind you, said friends don't have hundreds of table cloths for the same reason...) Just before we married, Ken and I bought a six setting 'Africa" design Royal Doulton dinner set for 'best'. It has been in the crystal cabinet in the dining room for 30 years and only seen daylight a dozen times. I said to Ken "We liked it so much when we bought it, but we hardly ever have the pleasure of using it on a day to day basis. 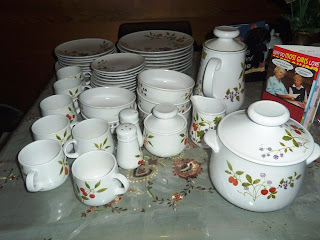 Why don't we move it to the kitchen for every day use and keep the new chook set for when we have guests?" He agreed, so that's what we have done. But tonight we decided to 'christen' the chooks. 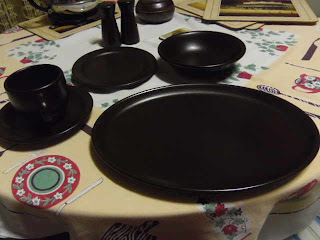 Guess what we had for dinner? Roast Chicken of course. ...In with the New. 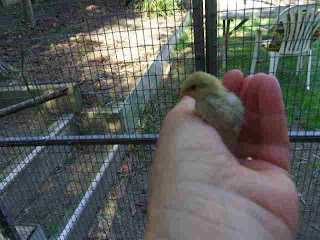 Newly hatched baby quail chick. Go to my birds blog to see more! All sounds good. I like a good reorganise! 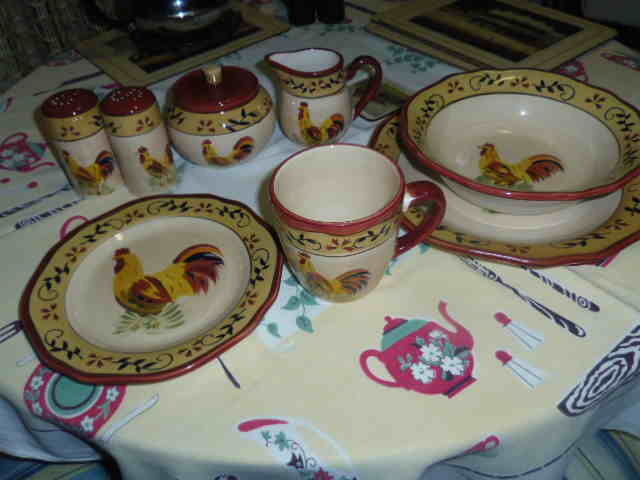 I love your chook set....a very nice modern style. I think I may be one of those friends who have several sets, way too much I truly agree. hugs to you both.